This week's harvest list was written up several days beforehand, edited based on a smaller workshare crew, then re-edited for weather, and changed one more time this morning - opting to skip harvesting something outside in the rain for something grown in a greenhouse. If it's one this this farm teaches - be flexible! I'm seeing a shift in the farm - it's gradual but obvious. Some plants have given us their all for many weeks in a row and are phasing out for the season. Other crops are showing their stuff and making it know they are ready to join in the action. Then there are some items that just aren't growing well at all and I doubt they will ever develop for harvest. So much to think about, ponder and observe walking around the farm these last few days. "The share smells like soup!" - said by one of the workshares as we were bagging up the produce today. We aren't the type of people who public announce beforehand a trip away from home, but I did hint of a weekend vacation in last week's post. This farm family was able to pack up and leave for about 4 days and visit family in Utah. We are very grateful to our neighbor and Workshare Andy who takes care of things while we are away. We also have a great group of workshares who stepped up this week to help us put together a nice share of produce on our vacation schedule and shortened harvest week. You will probably notice the squash and zucchini are on the larger size this week. I hope you can laugh along with us when I point out that this is what happens when you go on vacation - the squash & zucchini go crazy! It's nice to see that other things are also growing well. Good to see the cucumber plants putting out 50+ in one week. We made our last pick off the first planting of snap peas and moved over to a first pick off the second row. Shain says the bean plants are full of blossoms and some very small fillet beans. 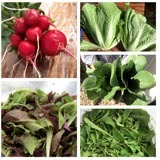 Other farm news: Shain put in another planting of salad greens this week, the last one of the season. He is preparing a place for us to plant garlic this fall. Our plastic sack "flags" seem to be keeping the deer away (see last week's photo). Farmer Shain is now pulling double-duty as Mr. Saberon, 8th grade English teacher extraordinaire. 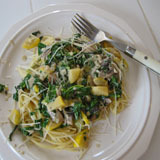 CSA Member Linda M. shared this Creamed Swiss Chard Recipe which I posted to our blog. She says it's wonderful. Please send me your farm food recipes or photos to share on this blog or our facebook page. Thanks! *Remember this garlic crop isn't the greatest. It's not 100% dried out yet, so keep it well ventilated. Use sooner than later (not recommended for storage). We also don't recommend using it for planting. Another nice share of produce! Nice weather. Good help from our Workshare crew. Yes, a good week indeed. We started sorting and cleaning up our garlic this week. Because of all the rains and high humidity, the garlic hanging in the shed isn't drying out very well. We opted to chop if all off the stalks and dry the bulbs on shelves in the house. Short newsletter again this week means we keep ourselves busy, busy. We have a family reunion to attend this weekend and school is just about to start back up again (for Shain and Eli). So while Fall is still a little ways away, our farm schedule is in for a big change starting next week. By now, I've got a crew of trained workers to back me up. Just in time as I see more crops that are poking their heads out of the ground (onions!). Making our famous salad mix! By the list of what is in the share this week, you can see that things are kicking up a notch and we are happy to bring you a few new items to enjoy. Think this will scare the deer away? Apparently some deer think our farm is an animal sanctuary and all-you-can-eat buffet. Their favorites are salad greens and peas. We are working around the issue and trying some ideas to keep them out of our rows of produce. Today we put up all these homemade deer "flags". The idea is that the white bags will flap in the wind and scare the deer away. Here's to pleasant nights with just enough breeze to do the trick! A new recipe idea (new to me at least) is to make "chips" out of the collard greens or Swiss chard. You've probably heard of kale chips. This is the same concept. There are many, many recipes on line but basically you cut up the leafy greens (removing the thick center stem, if desired), and toss with olive oil and seasonings. Then bake at a low temperature (or use a dehydrator) until crispy. Careful not to overcook, my experience is they go from "just right" to charred rather quickly. Sorry for this being a short newsletter. Je suis fatigué. The guys have been off on their annual Father/Son adventure (hiking in the Wind River Range) while I've stayed home to run the show. The first few days weren't too difficult, but throw in some busy harvest days on top of everything else, and I'm feeling it! This reminds me what a good team we make - running this farm together.